Alphabet soup: if the UDC aims to offer Sports Stadium Assistance, why was the BALDC created by the JDA (which finances machinery and equipment)? The text on the web page of the Bond Program offered by the state's economic development agency compounds questions raised by state Senator Bill Perkins about the legitimacy of the bonds issued for the Atlantic Yards arena. 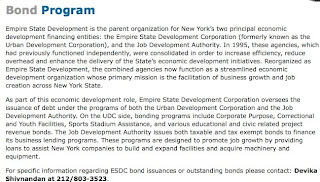 Empire State Development is the parent organization for New York’s two principal economic development financing entities: the Empire State Development Corporation (formerly known as the Urban Development Corporation), and the Job Development Authority. In 1995, these agencies, which had previously functioned independently, were consolidated in order to increase efficiency, reduce overhead and enhance the delivery of the State’s economic development initiatives. Reorganized as Empire State Development, the combined agencies now function as a streamlined economic development organization whose primary mission is the facilitation of business growth and job creation across New York State. If the UDC is supposed to offer Sports Stadium Assistance, then why was the Brooklyn Arena Local Development Corporation (BALDC) created instead by the Job Development Authority (JDA)? And if the JDA aims to help companies "build and expand facilities and acquire machinery and equipment," then why is it financing an arena? Hi Norman, I have a quick question for you. Reading the description of the bond program, it would appear that the JDA "issues both taxable and tax exempt bonds to finance its business lending programs". (the UDC description does not look like it contains any "tax exempt bond" language) Therefore, wouldn't the BALDC, as a JDA subsidiary, be entitled to issue tax exempt bonds in connection with the Atlantic Yards Arena (thus differing with Senator Perkins assertion that the BALDC had no such right)? 1) Yes, the JDA can, in general, issue tax-exempt bonds. 3) It doesn't look like the JDA's business lending programs are geared at sports facilities. 4) The June decision by the Court of Appeals casts doubt on the property tax exemption for LDCs; whether this can be extrapolated to the AY case is the question raised by Perkins. 5) Stay tuned. People with a lot more legal heft are surely looking into it all.